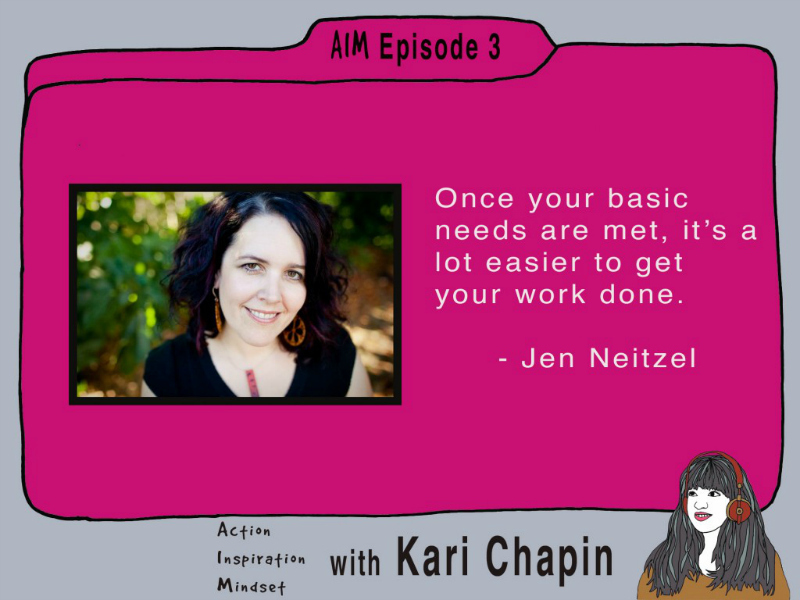 My friend Kari Chapin just started a new podcast called AIM. 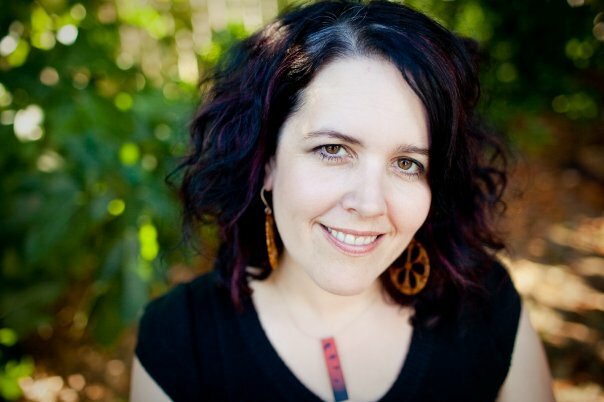 You might recognize her name, because she is also the author of The Handmade Marketplace: How To Sell Your Crafts Locally, Globally and Online and she’s done about a million other creative business projects as well. Kari told me she wanted to start a podcast and asked me if I would show her the basics. She knows that I’ve made podcasts and that I enjoy that sort of tech thing. We recorded this podcast in her house, while drinking coffee and eating muffins and then I helped her with the editing process. 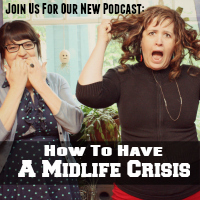 The episode we recorded was about how to squeeze extra creativity out of your day by really taking care of yourself, how to stop avoiding or procrastinating on projects, and the importance of identifying your basic needs and morning routines. When I went over to Kari’s site to listen to the final version of the podcast I was so touched by what she wrote about me. I feel like it’s less of a bio and more of a love letter! I actually think what she wrote of me is a reflection of the kind of person she is: generous, thoughtful, insightful, a good friend and a great writer. The graphics you see are pulled from Kari’s site. Aren’t they so good? She’s just that good! Here’s the podcast and write up. I thought I’d share a bit more about what my morning routine is these days because, although it’s pretty similar to what I said in the podcast, I have made some updates to my routine. When I wake up the first thing I do is make coffee. I use a Chemex coffee maker, which is basically a glass pot that holds a coffee cone filter in the top. It takes about 5 – 10 minutes to make. What I try to do in this time is pour myself my first glass of water for the day. I put my water in my coffee cup so that I cannot drink coffee until I’ve finished the glass of water. Then I drink coffee, glorious coffee. Most mornings I add a little gelatin to my coffee. The brand I use is made from grass-fed cows. I started using it a few weeks ago as a means of managing the arthritis in my neck and lower back. Interestingly, gelatin, which contains collagen, protein and tons of other nutrients that are good for you, is also a mild appetite suppressant. I’m all for eating food generally, but in the mornings I like to go on a run and I don’t like feeling much food in my stomach. The protein in my coffee is the prefect thing to get me out the door for a run. I used to be able to run for about 20 minutes, after taking a few running classes with my trainer, Kristin Jackson. I’m not a natural born runner. I never ran until I was in my 40s. I am someone who believes that running is the fastest, most efficient way to exercise and for me, it’s the best digestion accelerator I know of. My energy level and overall health really feel doubled or tripled when I’m walking/running regularly. Since I was in a car accident back in June, I’ve pretty much lost my running groove, but I’m getting it back again. If you’ve ever done a walk-to-run program, you know it’s all about intervals. You start out walking for 2 minutes and then you run for 1 minute. Typically, each week you increase your intervals: walk 1 minute/run 1 minute, walk 1 minute/run 2 minutes, walk 1 minute/run 3 minutes and so on. Because of the injuries I sustained in the car accident, I didn’t feel I was ready to increase my intervals each week, so I spent 3 weeks on the first interval. Last week I upped my interval to walk 1/run 1 and that is going well. 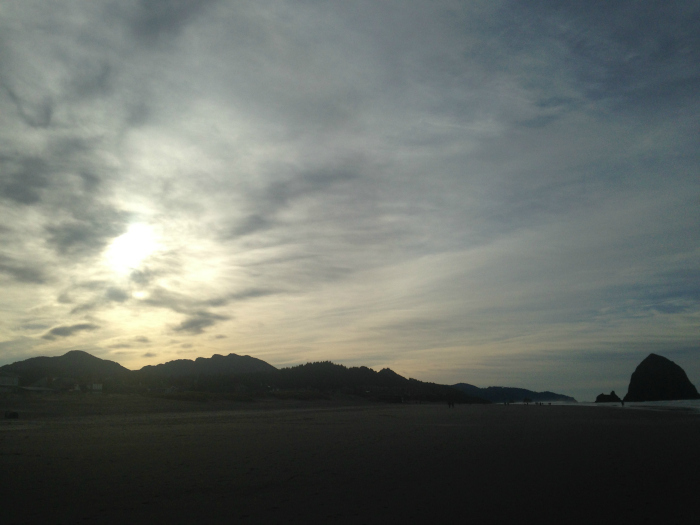 Taken while on my morning run at the beach. I love to listen to music while I run. I tend to listen to poppy hip hop. My favorite station at the moment is the M.I.A. station on Pandora. I also recently purchased some bluetooth earbuds. I decided to do the bluetooth thing because I was always pulling my headphones out of my ears in some clumsy moment or another and over time I have wrecked more than a few sets of headphones. I really dig my new earbuds. So much less to get tangled up in. After my run, I come back home and drink more water and sometimes more coffee. Then I eat breakfast. Depending on the day and my appetite, I try to eat a really good breakfast. I try to avoid sugar and grains first thing in the morning. Most of the time I feel like my body needs some protein and depending on how my digestion is going that day I might want to drink a smoothie too. I often make smoothies with frozen fruit (usually mango and pineapple), some fresh fruit (bananas, pears) and often I’ll add some greens to my smoothie. My favorite green to add is romaine lettuce. Here’s a blog post I wrote about how to change your skin through diet and exercise, where I also mention the great benefits of romaine lettuce. I try to drink more water with breakfast. Did you see this article of the woman who documented what happened to her when she started properly hydrating for 30 days? She did these before and after shots, and in the after shots she no longer has dark circles under her eyes, her skin is more taut and she generally looks younger and healthier. Next I do many different floor exercises that I was given by my various bodyworkers. I do core exercises, and I have really light weights that I use to do some toning of muscles in my back. I have heavier weights that I use to strengthen my arms and shoulders. I also have some exercises I do to open up my shoulders, which can get really tight. So that is really it. This is how I start my day every day. The only time I deviate from it is if I feel like I’m getting sick, or I’m just too tired to run. Even then, I might skip the exercises, but I still try to keep up with the food and water. What does your morning routine look like? Do you have one? Here’s a blog post I wrote a few years ago about how to start your own morning routine. For me, starting each day in a pretty similar way that includes hydration, food and exercise helps me frame my day. I don’t start the day with dread. I’m excited to start my morning routine. When I’m done with my routine I’m ready to start the day. There are always new and creative projects to be done in the world, and my morning routine is the prep work before I begin the creative projects. Great to see this post. My routine is to drink 2 glasses of water right away, then gather my clothes and shower, then eat a hard boiled egg for breakfast, then brush my teeth. I stick to it during the work week, but sometimes on weekends, I change it up a little.